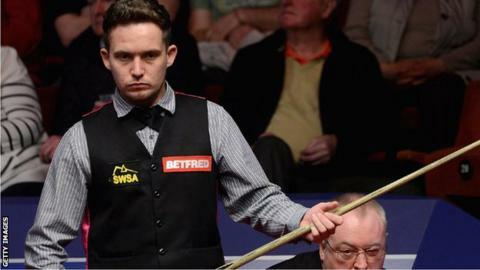 Welsh player Jamie Jones will return home to do some hot yoga after his 6-4 first round win over Ian Glover in the UK Snooker Championship. The 27-year-old from Neath has taken up the exercise regime to help him relax. He had a stressful match against England's Glover, trailing three times before winning through. "It was nice to get over the line after losing twice in the first round - I want to have a good UK because it is the second biggest event," he said. Jones will return to Wales before his second round match against either Xiao Guodong of China or Thailand's Noppon Saengkam on Sunday. He said his training schedule includes running, weight training and the form of yoga where the stretches are performed in a room heated to as much as 40 degrees celsius. "To be honest it's making me relaxed," he added. "I've only been doing it for two weeks now. They're all in the room praying and I'm just there trying to do a couple of stretches - you never know, maybe it will do my snooker a bit of good." Two other Welshmen were knocked out on the opening day of the tournament. Michael White was pipped 6-5 by Sidney Wilson while Gareth Allen was thrashed 6-1 by Liang Wenbo.